I have been dying to share this post with you guys for weeks! Seriously! When I was at at Haven this summer, I had the chance to meet a representative from Home Right. 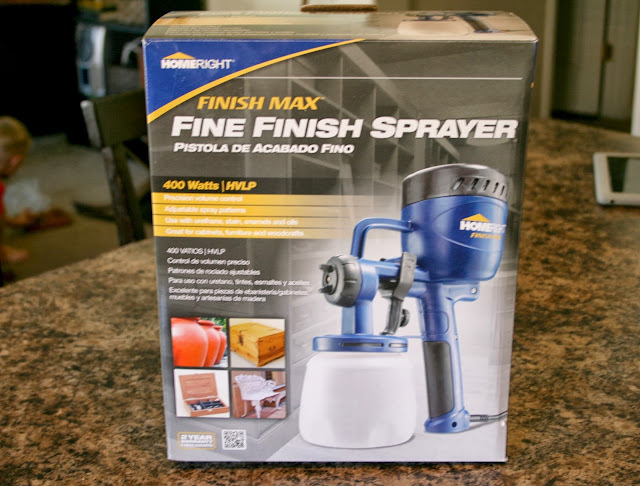 I had the chance to talk to her about the Finish Max Fine Finish Sprayer. A couple weeks later, I had a package sitting on my front step. I fell in love at first spray! I'm not kidding, this paint gun is life changing! 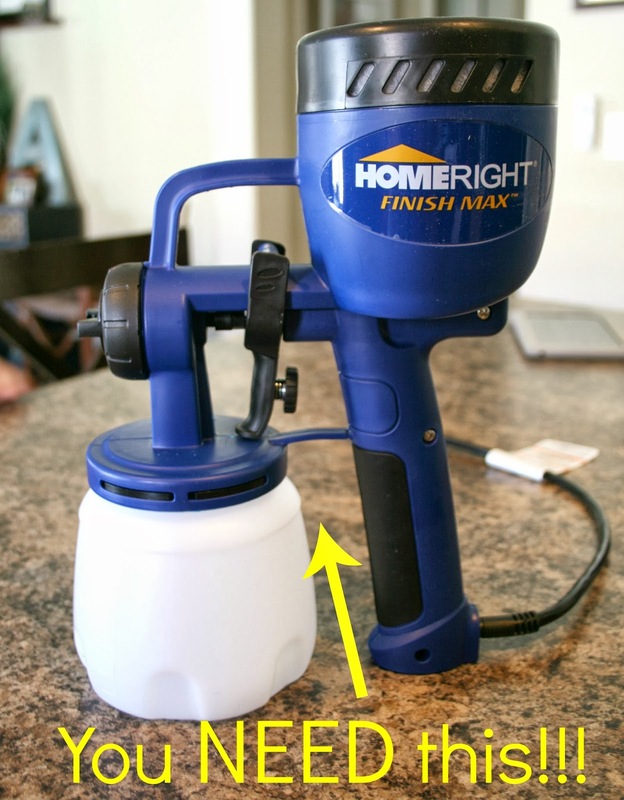 If you have plans to ever paint a piece of furniture, you need to get this gun. 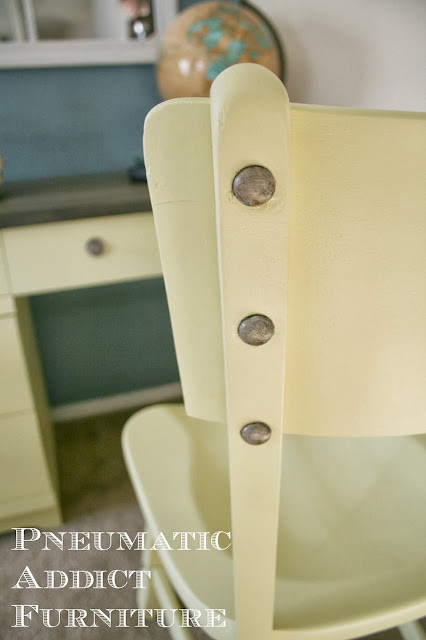 I've tried it with latex as well as chalk paint. You do need to thin most paints before running them through, but that's easy to figure out. The gun comes with a viscosity tester and a chart. 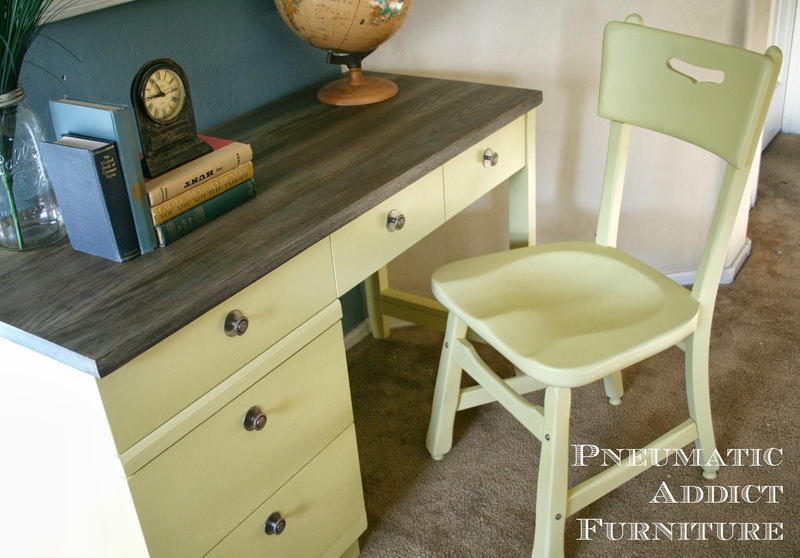 The first project I tried it on was the yellow Mid-Century desk and chair. Perfectly smooth, even painting with NO brushstrokes. It honestly took me 15 mins to spray the entire body, drawers, and chair. One of the nice things about spraying paint is how quickly each coat dries. I got 2 coats of paint and 2 coats of PolyAcrylic sprayed in an hour! I will never brush a chair again! I've used my pneumatic HVLP spray gun dozens of times, but the Finish Max leaves it in the dust. I was really surprised how powerful the motor is. I love the fact that I don't have to lug a compressor around! Its totally silent until you pull the trigger, and even then its maybe as loud as an electric sander. Even spray with great coverage. Can be a little heavy with a full cup of paint. Honestly, it was a bit of a struggle coming up with the cons. I haven't been so happy with a product in a LONG time. Yes, I received the Finish Max from Home Right in exchange for this post, but I would have happily written one anyways. When I discover an awesome product, I feel like I have to share it with you! All opinions are entirely my own. Please, feel free to ask any questions you may have about my experience with the Finish Max! Are you ready for some awesome news!? Thanks to the generosity of Home Right, one of you will get your very own Finish Max shipped to your house for free! Are you excited? Because you should be! Just fill out the Rafflecopter below for chances to win! I just finished painting a child's rocking chair with a brush and because of arthritis, my hand hurts! This sprayer would help me do the painting I want to do but can't. I would use it on my 6 kitchen chairs. I would use this to spray chalkboard paint on a little coffee table I found and convert it to a child's table. This is cool. I have a mid century modern dresser that is at the top of my list to paint but I have been putting it off because of the time it takes! I would paint my garage floor then stain my deck and then paint all the furniture stacked in my garage! I would use it on a table and 4 chairs I have been waiting to paint! I want to paint my out-dated oak dining room set. This would be a godsend. Thanks for the chance to win it. I am dying to paint my out-dated oak dining room set. This would be a godsend. Thanks for the chance to win it. I have several projects that I would love to try it on! I have a built-in desk in one of our bedrooms that needs some serious updating. Ohmygosh, I fell in love with this at Haven, too, and am dying to get my hands on it. What would I paint first? What WOULDN'T I paint? My best friend has a dining room set, hutch, and piano that we want to paint!?! So glad you love yours. It totally seems worth the money. I want to paint my kitchen cabinets so bad, and I feel like this would make it so much easier. I so want a a sprayer! I need this for like a hundred first projects! I'd love to use this for some smaller projects like a buffet I want to refinish. I have a china cabinet that needs redone BAD!! Oh boy! I'm preparing a rocking chair repair and redo - this would be a life saver! I would use it on some patio furniture that needs spruced up before being put away for the winter! My husband was going to refinish a wooden wagon for my boys.. I think this would be great for that. I would finish some chairs I have! It would be great to use on all the spindles. Do you have a tutorial on how to do paint with the sprayer with Chalk paint. Home Right just sent me one (yay), and I thought I couldn't do it. I know I need a thinner, but how much do I use to thin it? Does it look the same as when you hand apply chalk paint (the chalk look)? I don't have a tutorial but yes, you can spray chalk paint through the Finish Max. I have done it 2 or 3 times. You have to make sure to thin it quite a bit (use the viscosity tester) and use a sieve to make sure there aren't any lumps (especially with an old can). The finish is similar to flat latex paint. It does look a little "chalky", but more like a factory finish- perfectly even. I should also warn you to scrape off the excess paint around the nozzle often. 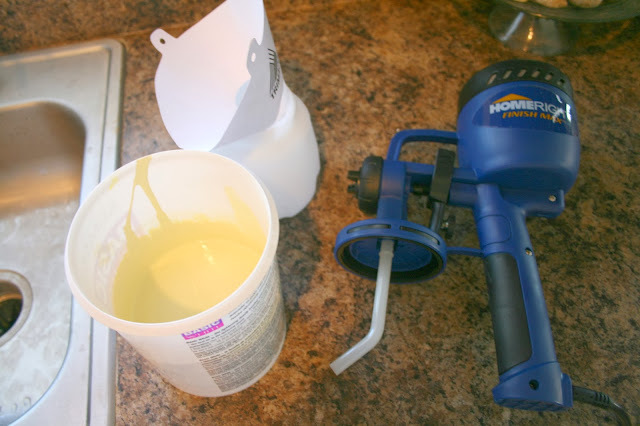 Chalk paint dries quickly and will clog the nozzle. Lastly, I wouldn't recommend spraying homemade chalk paint through any type of paint gun. In my experience, it thickens with time and could turn to glue inside your gun! I hope that helps! Please, let me know if you have more questions. I've had the Finish Max for several months now and I still LOVE it! I'm a huge fan. I've seen time and time again in blogland how so many can transform something really ugly into something completely differnt and beautiful with spray paint.